Many of you saw my blogger spotlight in the AccuQuilt newsletter. I have another layout using some applique that I wanted to share for those who come to my blog. 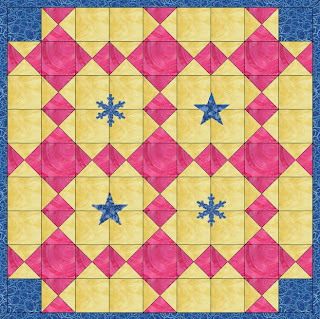 The layout is my "Pink Diamonds" quilt but with snowflakes and stars added in the open areas. You could of course add any shape you desire. You could also add applique inside the larger pink diamonds. This is a great place to let your creativity out to play. Tomorrow is my show and sale. Today I will be going to set up the booth and get it ready for show time. I am hoping for a good turn out and lots of sales. For now, I have quilts piled on the bed and have started rolling them up. I like to roll them so there aren't any creases in them when they are displayed. Oh, there are also some table runners in that stack. I have boxes packed with jewelry, display items, note cards, etc. If you are wondering about the "E Black" on the box, my actual name is Eugene - Gene for short. There is one painting on top of that box too and a bag of quilted purses. There are more boxes AND more paintings. Whew! Now what am I forgetting? I suppose I will find out when I start setting it up. ha ha. Oh my, I just remembered, there is one more box in that closet! I best not forget that one. Good for you getting so much stuff ready for your show and sale! I know how much effort that takes!! I hope you make lots of sales. Some crafters I know who have gotten into juried shows have said that lately, there are a lot of people looking but not as many people buying. Sad, but I guess it's a sign of the poor economy. I hope you get more buyers and few who are just looking! 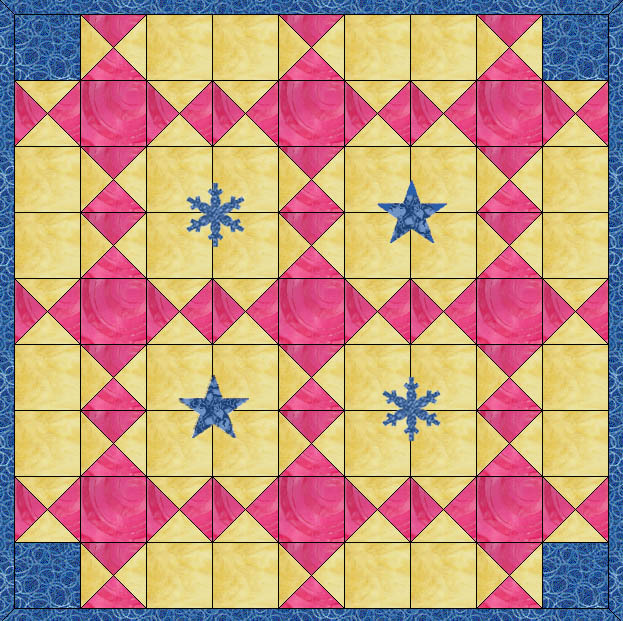 Love that diamonds quilt with the snowflakes and stars on it. Good luck tomorrow E Black! Best wishes for your sale tomorrow!! How can it be show time again?! Looks as if your inventory has mushroomed, hope everytrhing moves on to new forever homes. Happy Thanksgiving! Finally - I got something done.